Le cinéma français dans toute sa splendeur, sommaire et presque scolaire, mais pour les séniors. Il a au moins le mérite de faire briller ses deux acteurs principaux. Once again, Haneke shows his mastery of simple story telling. This time it is heartbreakingly honest and lead by a pair of actors that sell every scene with chilling authenticity. A difficult watch but worth the emotional roller coaster. Really, really beautiful - just too bad that the main characters at time seem to be employed just as decor pieces rather than letting them live a bit. Beautiful & emotional story about a loving & otherwise well-off elderly couple struggling with the process of inevitable tragedy, having to balance their sense of dignity & caring in face of natural decay. Haneke directs with a steady grip allowing the awesome performances to carry the drama while still executing some minimal yet effective editing tricks. I guess everyone has a different experience with death but for me the rough naturalism with underlying romanticism was not entirely seamless. 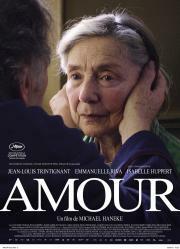 Jul 19, 2018 Iulius E. S.
With towering performances and an unflinching script from Michael Haneke, Amour represents an honest, heartwrenching depiction of deep love and responsibility.